Welcome to 2011, the four-hundredth birthday of the King James Version of the Holy Bible. Many in the English-speaking world will be joining the celebration. And no wonder—the King James Version has been read by more English speakers and has done more to shape the language than any other document. These days, Christians express mixed attitudes toward the King James Version. On the one hand are some who treat it as if it were written in a foreign language. They prize readability above all else, and they seem to think that an ordinary person of the 21st century cannot reasonably be expected to decipher such an arcane text. They value the King James Version only as an historical oddity, to be relegated to the museum of religious antiquities. Of course, what the advocates of this second position usually value is not so much the King James of 1611, but the revision of the King James that occurred in 1769. Different publishers, however, have issued different editions of the 1769 revision, and these contain differences in wording. Matthew Verschuur of Australia has gone so far as to insist that only the “Pure Cambridge Edition” of the King James Version is to be accepted as the true Word of God. Divergent as these two attitudes are, they have one thing in common. Neither takes adequate account of the phenomena of Scripture itself. For example, King James Only advocates have difficulty explaining the divergent ways in which the text of the Old Testament manages to find its way into the New. They have further difficulty explaining how the sayings of Jesus could be rendered differently in the various gospel accounts (e.g., Matthew’s choice of “kingdom of heaven” where Mark and Luke prefer “kingdom of God”). Most of all, they have difficulty finding an actual promise of textual preservation anywhere in the Bible. All of these considerations should give anyone pause before subscribing to the theory that we only have the true Word of God if we have the exact words of God. Similar problems beset those who wish to retire the King James in favor of “readability.” Of course, Scripture is written to be understood—that is its perspicuity. Affirming that Scripture can be understood, however, is not the same as insisting that its meaning ought to be transparent to a shallow reader upon a fleeting and facile scan of the text. The original readers of Scripture could hardly have expected such simplicity. Even the apostle Peter gave voice to the difficulty he experienced in understanding Paul’s writings. And no wonder. Thoughtful writings—whether inspired or not—are often characterized by a measure of dense translucence that can be penetrated only by wrestling with the text. The simple truth is that thoughtful reading requires thoughtful readers. When writers have to explain difficult concepts, they often employ technical vocabulary and intricate grammar. We find biblical writers doing both. The apostle Paul is famous for extended sentences filled with dependent clauses and parenthetical insertions—and Peter is sometimes not far behind. The terminology of Luke the physician is richer than that of John the fisherman, and the architecture of his syntax is correspondingly more complex. Reading Paul is not terribly unlike reading Aristotle. The writer to the Hebrews employs some of the most difficult Greek anywhere. In the attempt to heighten their language, the writers of Scripture often deploy devices that were not part of ordinary street-talk. Poetical sections in particular are filled with archaisms. Listing the various tropes used in the text of Scripture would fill a cyclopedia of figurative language. The early perpetuation of Scripture also affects the issue of clarity. By the time the New Testament was written, the language of both the Hebrew Old Testament and the Septuagint was at least mildly archaic. Nevertheless, Jesus and the apostles continued to employ these documents and to expect others to do so. The clarity of a translation is important—especially for Holy Scripture. Clarity, however, must not be reduced to mere “readability.” If the tradeoff for clarity is a significant loss of precision, then the price may well be too high. We should not feel obligated to make the Scriptures more clear than God Himself did. The translator helps nothing when he attempts to resolve vagueness or ambiguity by making interpretive decisions for the reader. To assert that “God says” is miles away from humbly suggesting that, “I think this means….” Translators necessarily do the former, which means that they must resist the temptation to insert the latter. The King James Version strikes a very good balance between accuracy and clarity. In spite of occasional failures (largely enforced by King James’s own dictates), the translation is remarkable both for its precision and for its intelligibility. Anyone who can understand Mortimer Adler’s How to Read a Book can understand the text of the King James Version. The translators of the King James Version went beyond balance, however. What they produced is not merely a good translation. Their work is critically regarded as one of the great literary masterpieces of the English language. By translating at a high literary level, they have followed biblical writers such as Asaph and Isaiah, who were themselves masters of literary excellence. The glories of the Psalms and Prophets must not be lost to abecedarian translational technique. In the King James Version, they are not lost. Indeed, the cadences and locutions of the King James Version have seeped deeply into the heart of the English-speaking world. Translations should reflect the literary level of the original text, and even the Greek of the New Testament was not really ordinary speech. It was not the Greek that one would hear in the shambles or even that one can read in the papyri. It was more formal, and at times it was crafted carefully according to literary considerations (the writer to the Hebrews is a master of literary technique). Some are bothered by archaisms in the text of the King James Version. They need not be. Most of those archaisms are fairly easy to decipher. By performing that task, contemporary readers are imitating the original readers of many biblical documents. What is more, the archaisms serve a valuable purpose. They teach us that Scripture did not just come into being yesterday. They underline the truth that Scripture provides enduring answers to permanent questions. The Bible is not a book to be perused for momentary amusement, but one to be studied for life. In the case of truly obsolete language, the King James Version can and should be updated. It has been before. It can be again. The work should be undertaken with reverence, not merely for the content of what is revealed, but for the locutions of the King James Version itself. No more should be changed than is really necessary. The people who would perform this task would place all readers of English in their debt. It will never happen. The New King James Version fails by making changes that are unnecessary and sometimes banal. It is the worst of all possible worlds. No other translation, however, is likely to do better. The problem is that a version incorporating only necessary changes could never obtain an exclusive copyright. No publisher could hold exclusive rights to it. With no large sums to be made from a gentle revision, the printing houses will distribute and the pious will receive only a continuing stream of translations du jour. Therein lies the real problem with the proliferation of modern translations. Few of them are objectionable in their own right. Most of them contribute something, and most are worthy of being consulted by readers who cannot understand the Hebrew, Aramaic, and Greek. In the multiplication of translations, however, today’s Christians have lost significant intelligibility in sharing the Scriptures with one another. On the average Sunday, even among fundamentalists, one can find churches using (at minimum) the King James, the New King James, the New American Standard, the New International, and the English Standard versions. One never knows what Bible to carry when visiting a new church. One hardly knows which version to memorize—what is learned from one version this year may become obsolete when the church changes its Bible next year. How many Christians appreciate the irony that most new versions include the word Standard in their title? The fact is that the English language has only ever had one standard version, and that is the King James. Beginning with the publication of the New American Standard Bible, the English-speaking evangelical world has lost any semblance of, and probably any hope for, biblical standardization. How could anyone not see this as an evil? Worse, the comparison of versions has made the Word of God into a consumer commodity. In order to attract the purchasing public, every new translation, paraphrase, and amplification has to have its own signature features. Its publisher must convince readers of the in-sufficiency of all previous versions. The purchase of a Bible becomes akin to the selection of a designer tie or perfume. One chooses a version like one chooses a flavor of soda. How can the transitory nature of modern versions not cast aspersion upon the enduring nature of God’s Word, and, consequently, of His character? In sum, a good version of the Bible will be accurate, but it will not oversimplify. It will choose elevated language because it aims to shape feeling as well as thinking. It should be widely used and readily shared. It must leave the reader with the impression that the book wasn’t just written yesterday. It ought to be just a bit archaic. In my opinion, the King James Version is the only translation of Holy Scripture into English that meets these criteria. It is not just a good version, it is a great one. It is both a great translation and a great work of literature. For me, the use of the King James Version is not simply a matter of nostalgia or sentimentality. It is unsurpassed for use in the corporate church setting, and it is as good as any for private devotional reading. If others think differently, then they may use any faithful version without offending me. If I am preaching in their church, I will honor the church’s choice of Bible. At one level, it is a joy to have many good versions at our beck and call. All the same, I wonder how many of those versions will be celebrated four hundred years from now. Of so divine a guest. Unless it come from thee. No rest is to be found. And send it from above. This essay is by Dr. Kevin T. Bauder, president of Central Baptist Theological Seminary (Plymouth, MN). Not every professor, student, or alumnus of Central Seminary necessarily agrees with every opinion that it expresses. The NKJV pretty much is an update of the KJV. Though it has some unfortunate translation choices, so does the KJV. All translations have flaws. When I hear folks downplay the effort involved in getting to an accurate understanding of what God said via the KJV, I can't help but wonder how often they've worked with folks with average or sub-average education explaining verses to them. I agree strongly with Kevin that the answer is not to dumb down the text. But there is much between the extremes of handing them a 400 yr. old translation and saying "OK, learn the Bible, but learn Elizabethan English first" and handing them a dumbed-down, reduced vocabulary translation at the 3rd grade reading level. Let's not act like these are the only two choices. I had a discussion once with someone about the English that the KJV employs. His contention, and he had sources, was that the KJV uses a nearly unique, almost transcendent, "dialect" that was never really used at a particular time in history, that it wasn't truly Elizabethan. His point was that such elevated English language honored the Word of God. I countered that if the Greek text wasn't a special, elevated Greek, then we should not translate it into that sort of English. But apparently portions of the Greek are just that. Don't know if this fellow didn't get my point, or if he was not aware of the fact, but he didn't make point that out to me. Aaron, as to your reduced vocab version, I know this calls for speculation, but do you think thats how the first century church leaders dealt with the book of Hebrews with the less literate in their flocks? What are often viewed as archaisms are Hebraisms and Greek syntax. Anticipatory accusatives ("God saw the light that it was good"), superlatives such as "vanity of vanities", "King of Kings", "Lord of Lords" and double prepositions are examples of Hebraisms. English readers/speakers may be uncomfortable when the verb precedes the subject, with present tense verbs describing past events, or with long, complex sentences- but these in fact mimic the Greek language. Which is why the KJV isn't Elizabethan English, and one of the reasons some (myself included) prefer it over most modern translations. I think there is a potential for confusing categories here. There is a difference between http://en.wikipedia.org/wiki/Register_%28sociolinguistics%29 ]register , literary sophistication, and difficulty. One can speak or write in a low register with a high level of literary sophistication, or in a high register without any regard for literary style. In general, the New Testament prefers a low register, though it maintains throughout a high sensitivity to literary considerations. Occasionally, we see instances of a higher register break out, but those spots are significant for their relative scarcity. Neither register nor literary structure necessarily make reading difficult. The greatest difficulties in reading NT Greek are the Aramaisms, Semitic idioms, and Septuagint quotations woven into the Greek text. Also, "not terribly unlike" is vague, but I fail to see any appreciable correlation between Paul's Greek and Aristotle's. I've read all of Paul and a decent bit of Aristotle, and the comparison strikes me as simply wrong. They aren't writing the same genres, and they aren't writing in the same period of Greek. Aristotle was Macedonian, thus was raised speaking Ionian and learned the Attic dialect. The rise of Hellenistic (or Koine) Greek is a generation after Aristotle, and even then wasn't used in traditionally Greek territories. The prevalence of Koine caused a reaction, in which the Atticists declared that only the Attic dialect was the proper model for Greek prose. The salient point is that the New Testament writers universally rejected Atticism in favor of Koine. So, despite occasional "Atticisms," no NT writer (including the higher register Hebrews) is really much like Aristotle. If any Attic writer, the NT is more like Xenophon. So, in terms of the language employed, the NT is quite an easy read (perhaps with a few exceptions). The difficulty certainly comes from the subject matter. "And the Word was made flesh, and dwelt among us" is elementary in English and Greek, but how much depth it contains. Dr. Bauder has given us all an article to argue about. Few will agree completely, so we will all take sides based on what we already believed. Instead I think I'm going to tuck this one away for awhile and think about it. There are lots of reasons people love the KJV, and I appreciate Dr. Bauder's defense of it. I agree that the literary qualities of the KJV are underrated by many today and are not duplicated in any of the other versions. It seems to me (opinion) that there is something to his contention that it is reasonable to expect people to attempt to gain a greater understanding and appreciation of language to learn more completely. What kind of "updates" in a translation are reasonable to expect? I think I do agree that the literary qualities of KJV are largely missing in versions we have seen more recently. Obviously, the issue of profiteering from more recent versions is a legitimate one. To me, these are legitimate reasons to see KJV as a standard, and that I haven't seen a consensus pick that replaces it. The University of Michigan in Ann Arbor is currently celebrating the 400th anniversary of the KJV with an exhibit in the Hatcher Graduate Library, for those who are interested. It is not a large exhibit, but it does contain a number of papyrus manuscripts, as well as editions of the Vulgate, Great Bible, Bishops Bible, Geneva Bible, and of course, a first edition 1611 KJV Bible. Well, we do this in sermons all the time anyway. The question is, what do I want them to be able to figure out when I'm not standing behind the pulpit to re-translate the translation? I actually wondered, back when we switched to NKJV as the preaching text, if my sermons would get shorter with so much less to explain. But, no, they didn't. Does seem like I'm able to focus a bit more on significance and a bit less on defining English words. But since we've got some NIVs and some NASBs in the congregation (as well as quite a few KJVs), I still have to pause to talk about why they are not seeing the same thing I'm reading. But one benefit of the multitranslational environment we are now in is that people more naturally understand that they are looking at a translation and that none of these should be viewed as perfect. There are downsides to multiversionality but there are also advantages. The New King James Version fails by making changes that are unnecessary and sometimes banal. It is the worst of all possible worlds. No other translation, however, is likely to do better. I could not possibly disagree more. My own testimony is that I memorized HUNDREDS of verses from the KJV in Lutheran grade school -- and scores more passages from Luther's Small Catechism that were rooted in the KJV or KJV-like-speak. After reading the NKJV now for more than 20 years, however -- with no concerted effort to memorize it during much of that time -- I find myself "thinking in NKJV," even struggling to remember the exact wording of the KJV when necessary. To be practical about it, if you do not want the "KJV legacy" to eventually disappear and be found somewhere next to the Geneva Bible on the historical shelf, I would think you would want to promote the NKJV for all it is worth. The old KJV is being used less and less every day and -- aside from the committed KJVO -- I believe it will ultimately disappear from practical usage. I agree that your first post did not fit my description. Neither did anything that followed. I hope my statement proves to be wrong. Anyone who can understand Mortimer Adler’s How to Read a Book can understand the text of the King James Version. Boy, I sure hope that's not the standard for Bible readability and "understandability." Would I be wrong to think that most (or even a majority of) people today could not read How to Read a Book with comprehension? I agree with Aaron. I think Dr. Bauder grossly understates the obstacles KJV English presents to the average English-speaker. I would again recommend the book "IN THE BEGINNING- The Story of the King James Bible and How It Changed a Nation, a Language, and a Culture"[/u ] by Noted Oxford historian Alister McGrath, Anchor Books, 2001. This book sets forth the great influence of the KJV but also the great restrictions and limitations that make it an imperfect translation. You will find that the KJV is not in Elizabethan language as some commonly claim. Also, it actually standardized the English language. 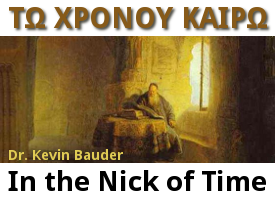 It also sets forth the great weaknesses of the translation such as the translators not being aware of the existence of the Koine Greek and trying to translate a Greek dialect they were not aware of. It also sets forth the lack of understanding of Hebrew as many discoveries that would give us better understanding of the language were yet to be made. This book gives high praise of the KJV and its influence but does not ignore the flaws and the facts of history. We owe a great deal of theological confusion to the KJV. Such words as Baptism, Church, Deacon, Bishop, Propitiation, and Justification, have created an ambiguity in many interpretations. There has never been confusion with the Greek Orthodox regarding "Baptizo." They immerse their babies. The noun "Pistis" is translated 243 times as "faith" and the verb "Pistuo" also appears 243 times and is always translated "believe." Faith comes from the French and derived from latin. "Believe" is a English word. They do not mean the same thing. Are we saved by faith or are we saved by believing? To this is added the confusion of the English word "repent," which does not convey the intent of the Greek at all. Now we have several opinions of what "repent" means when the word should probably not be in the NT Biblical vocabulary at all. Some even talk of "repentant faith" which is a phrase never appearing in scripture and actually redefines "faith." Such confusion may exist because we are embracing KJV words used and not willing to really translate in a way that will avoid bad translation tradition and embrace true clarity. There is often a false loyalty to the KJV that presents needed vocabulary change in translations. The KJV is a good translation but far from perfect. Its eventual wide acceptance put the Bible into the hands of the average English speaking person. This would eventually change theology for many Christians. The clergy pseudo intellectual conspiracy of Calvinism would be widely questioned and new consideration would be given to Eschatology and other aspects of theology. However, today we have translations that meet the criteria of being better translations than the KJV. This began with the 1901 ASV and then the NASB, the NKJV, and now also the ESV. The original NIV also was a good translation in spite of its so called dynamic equivalency approach. Most born again Evangelicals today use other than the KJV. Most all evangelical churches are using other than the KJV in their services. IMO Fundamentalist churches that still use the KJV in their services are perpetuating tradition over a duty to present and teach the word of God with clarity and understanding. Clergy comfort should not exceed Divine intent. Regardless of motives we should not fear or discourage new translations. We can use discernment and inform as to weaknesses and strengths. Either make every Evangelical proficient in Greek and Hebrew or rejoice in the providence of God giving clarity to the real intent of His word to us. I too appreciate the literary contribution the KJV has made, along with the 400 years of spiritual activity that has happened in association with the KJV. But it goes without saying that there are interpretive hazards for those who are strictly KJVO. I was reminded of this just this Christmas while talking with someone who was KJVO. The dogmatic claim was asserted to me that Christ Himself appeared to the shepherds in Luke 2:9, to announce to them His own birth. I found it strange I had never heard this position before, so I asked what the basis of it was...and the answer was that it says right there in the text that it was "The Angel of the Lord" that came upon the shepherds. I was told that whenever you see "The angel of the Lord" in the OT it was a formula for a pre-incarnate visitation by Christ Himself. So I checked my Greek text and the wording there is simply angelos kuriou (no textual variants). So modern versions correctly translate this "an angel of the Lord." The KJV translators made the interpretive decision to add the article to angelos in their translation. No big deal...unless you believe the KJB to be the one and only Scriptures. Of course many other examples could be brought forward. But as to the 400th anniversary, I had thought initially that this milestone would become a feather in the cap of the KJVO movement. However, the anniversary also highlights an uncomfortable truth for the KJVO advocate--that the KJV had a beginning, and it was not with the apostles. But as to the 400th anniversary, I had thought initially that this milestone would become a feather in the cap of the KJVO movement. However, the anniversary also highlights an uncomfortable truth for the KJVO advocate--that the KJV had a beginning, and it was not with the apostles. Kevin shares the first. I would be interested to read more papers on SI in regards to this 400th anniversary. Bob, I read that book you mentioned. Interesting book. And Aaron, just for your information, last year our church family switched over to the NKJV for a church text. I have decided that the Holman Christian Standard will be the bible for myself and family. For over a decade, it has stood against the many changing versions you see on the market: KJV, NASB, NIV, etc. In fact, it has demonstrated the preservation principle. For those reasons I am HCSBO. My bible does not need to sound archaic at all. It just needs to be accurate. 1 Kings 8:60 - so that all the peoples of the earth may know that the LORD is God and that there is no other. HCSB is nice in many ways, but I do find more than once where I have taken exception with wording. I know for a fact in John 1:18 where they have "one and only Son" instead of "God" that they chose that reading as influenced by something written by Bart Ehrman, and that they had contacted Dan Wallace for a response to Ehrman, but by the time Dan replied, they had already gone to print with "one and only Son." My concern isn't necessarily the reading that they went with, as it is a close call, even though IMHO I think the reading theos is more likely original than uios. My concern is the fact that they were seeking out assistance from Bart Ehrman of "Orthodox Corruption of Scripture" fame. Hold the Phone, what about Accuracy? I appreciate Bauder's point here. But he dodges an issue which apparently he didn't really weigh in on in the book he co-edited on the KJB debate either. A big reason why I don't use the King James Bible and why I don't recommend the New King James Version, is that I believe they are based on Greek texts which are inaccurate. They are less accurate than the basis of the other modern Bible versions we have in use today. In several important places, the differences between the King James Bible and its heirs, lie in the realm of textual basis not translational technique (not to mention the presence or absence of archaic language). I agree with hundreds of years of Christian scholarly thought in saying the differences over all are minor, and that no cardinal doctrine is affected by these differences, but texts such as Acts 8:37, 1 John 5:7, 1 Tim. 3:16 and the like have noticeable differences and present problems for the average churchgoer. I suppose we'll still have to address them, no matter what Bible you use, but why choose one that is less accurate both in terms of textual variants, and in terms of lexical precision? It certainly seems that tradition is what this is about, and we're loathe to change (even though our Baptist forebears weren't averse to amending the KJB to fix the "baptism" problem among others). On a related note, I thought this quote above from Bob Topartzer to be both forceful and painfully accurate. Striving for the unity of the faith, for the glory of God ~ Eph. 4:3, 13; Rom. 15:5-7 I blog at Fundamentally Reformed. Follow me on Twitter. I do like it to feel "churchly," though. That is one reason I like the NKJV. It also has a very familiar feel. While Dr Bauder summarizes the case against KJB Onlyism quite nicely, I"m not sure about his aggression against modern versions. I guess I didn't understand why we should advocate for an elitist, high literary version based on Asaph, Isaiah, and Luke, but not for more "abecedarian" ones based on David, Amos, John, and Peter. In the area of communicating God's Word, I think the argument's been made--perhaps inadvertently--against linguistic chauvinism. God used a variety of genres and registers to bring across His thoughts and His messages. How is it wrong, then, to receive the plethora of genres and registers available in our bookstores and Wal-marts with grace and gratitude, that we can indeed choose the right tool for the right job. For the higher-browed, perhaps a King James 1769, nay, a 1611 facsimile. For Ploughboy Pepe, perhaps a CEV. For the Christian on Wall Street, The Message. For the kid from a traditional Christian home who wants to retain some of those KJB-esque cadences, an NIV or ESV. For struggling seminary students, the NASB or some Interlinear. For pastors pre-checking their sermons, everything at biblegateway.com and more. For everybody at Christmas, the KJB! Yes, we're all grateful for this amazing work of 400 years ago that still leaves its mark; we're thus also reminded of another amazing work that reigned 1,200 years--the Latin Vulgate. But let's not go overboard and undermine the achievements since. Other than the Cotton Patch Bible and the New World Translation, there are not many Bibles we should train our guns at. Nor is there a need to. The real challenge is to "give the sense" so that conviction, conversion, and consecration may follow. IMO Fundamentalist churches that still use the KJV in their services are perpetuating tradition over a duty to present and teach the word of God with clarity and understanding. Clergy comfort should not exceed Divine intent. A big reason why I don't use the King James Bible and why I don't recommend the New King James Version, is that I believe they are based on Greek texts which are inaccurate. They are less accurate than the basis of the other modern Bible versions we have in use today. And I believe the textual foundation for the KJV and related translations to be more accurate than other modern versions. Hence we have a 'my sources trump your sources' quandary, with each attacking the other's character for acting on their own conscience in this area. What broad accusations to make against such a large segment of Christianity. Amazing. The "you're either a moron or dishonest if you use the KJV" argument is no more helpful than "you're a faithless heretic if you use anything else". Here I thought there'd at least be some respect and rejoicing in how God has blessed and used His Word over the years, and the miraculous preservation of it over the centuries. You may be a dishonest, KJV moron, but at least you're not a clergy pseudo intellectual Calvinist conspirator (like Alister McGrath by the way). I don't mean to castigate all who use the KJB. I just find it interesting that many who actually point to some of the textual differences between the texts as being less important than King James Onlyists claim, and who actually admit that many times the KJB gets it wrong, that some of these same people nevertheless use the King James Bible because of preference and tradition. Even when it comes to the Majority Text, if you prefer that over the TR, you should go with the NKJV rather than the King James Bible, then. Because at least the NKJV has the MT in footnotes, when it differs from the TR used for its text. "Beauty exalts, but beauty also lulls." Great quote by Lewis. I found when I first started using the ESV (my first translation choice after the KJB), that for all my intellectual knowledge of the archaic words and phrases in the KJB, and for all my familiarity with it, it really did affect my understanding of the Bible immensely. It was like the Bible came alive when read from the ESV. We are also celebrating the 454th anniversary of the Geneva Bible, which fell out of usage with the arrival of the KJV. We are also celebrating the 400th anniversary of the 1611 KJV, which virtually no one has used since 1769. We are now celebrating this year the 242nd anniversary of the 1769 KJV, which has been on a downward trend of usage over the last 40 years. We are also celebrating the 29th anniversary of the 1982 NKJV. All of the above are more or less part of the same English version tradition. Whether or not you agree with Kevin, he has shared what is important to him, as well as the extent to which he will allow his conclusions to affect his fellowship. I am very aware (after just concluding 2 weeks/30 hours total with him in the classroom) that he both allows his convictions to shape his practice (he read from the KJV in the classroom when lecturing, while occasionally supplementing it with his own free translation-on-the-fly) while not serving as a hindrance to fellowship (he was aware that the majority of his students were referring to ESVs, and did not comment on the matter one way or the other in any meaningful way). While expressing his conclusions regarding the NKJV, he is an active member of a church where the pastor preaches from it as the translation of choice. What I am taking away from this is that there are things we can appreciate and even have strong sensibilities about, while still recognizing that there are issues that ultimately "outrank" those matters. One can differ on which textual family takes precedence and not be relegated to "apostate" or "heretical" level on the Department of Fundamentalismland Security scale. You can debate how he reaches his conclusions (I'm not granting permission or anything, just observing it's "on topic" and fair game), but I am somewhat surprised that no one seems to have commented on the level of irony that one of the perceived primary opponent of KJVOs (certainly within Fundamentalism proper because of http://books.google.com/books?id=uQWTxDdIO6IC ] One Bible Only ) is articulating a defense of the KJV and being castigated (to some degree, anyway) by MT proponents. Thank you Darrel for mentioning Tyndale whose work transferred over to the 1611 KJV without any credit.